IBM employs 130,000 people in India — about one-third of its total workforce, and more than in any other country, even the U.S. It’s a high-tech example of the globalization trends that the Trump administration has railed against. BANGALORE, India — IBM dominated the early decades of computing with inventions such as the mainframe and the diskette. Its offices and factories, stretching from upstate New York to Silicon Valley, were hubs of U.S. innovation long before Microsoft or Google came along. But over the past decade, IBM has shifted its center of gravity halfway around the world to India, making it a high-tech example of the globalization trends that the Trump administration has railed against. The company employs 130,000 people in India — about one-third of its total workforce, and more than in any other country. Their work spans the gamut of IBM’s businesses, from managing the computing needs of global giants like AT&T and Shell to performing cutting-edge research in fields such as visual search, artificial intelligence and computer vision for self-driving cars. One team is even working with the producers of “Sesame Street” to teach vocabulary to kindergartners in Atlanta. “IBM India, in the truest sense, is a microcosm of the IBM company,” Vanitha Narayanan, chairman of the company’s Indian operations, said in an interview at IBM’s main campus in Bangalore, where the office towers are named after U.S. golf courses like Peachtree and Pebble Beach. The work in India has been vital to keeping down costs at IBM, which has posted 21 consecutive quarters of revenue declines as it has struggled to refashion its main business of supplying tech services to corporations and governments. The tech industry has been shifting jobs overseas for decades, and other big U.S. companies like Oracle and Dell also employ a majority of their workers outside the United States. But IBM is unusual because it employs more people in a single foreign country than it does at home. The company’s employment in India has nearly doubled since 2007, even as its workforce in the United States has shrunk through waves of layoffs and buyouts. Although IBM refuses to disclose exact numbers, outsiders estimate that it employs well under 100,000 people at its U.S. offices, down from 130,000 in 2007. Depending on the job, the salaries paid to Indian workers are one-half to one-fifth of those paid to Americans, according to data posted by the research firm Glassdoor. Ronil Hira, an associate professor of public policy at Howard University who studies globalization and immigration, said the range of work done by IBM in India shows that offshoring threatens even the best-paying U.S. tech jobs. While other technology titans have also established huge satellite campuses in India, IBM has caught the attention of President Donald Trump. At a campaign rally in Minneapolis just before the November election, he accused the company of laying off 500 Minnesotans and moving their jobs to India and other countries, a claim IBM denied. Although he has not singled out the company for criticism since, Trump has tried to curb what he viewed as too many foreigners taking tech jobs from Americans. In April, he signed an executive order discouraging the granting of H-1B temporary work visas for lower-paid tech workers, most of whom come from India. IBM was the sixth-largest recipient of such visas in 2016, according to federal data. IBM, which is based in Armonk, New York, is sensitive to the perception that Americans are losing jobs to Indians. After Trump won the election, IBM’s chief executive, Ginni Rometty, pledged to create 25,000 new U.S. jobs. Rometty, who helped carry out the Indian expansion strategy when she was the head of IBM’s global-services division, has discussed with the new administration plans to modernize government technology and expand tech training for people without four-year college degrees. She also joined one of Trump’s now-defunct business-advisory councils. IBM declined to make Rometty or another top executive available for an interview. But the company noted that it is investing in the United States, including committing $1 billion to training programs and opening new offices. 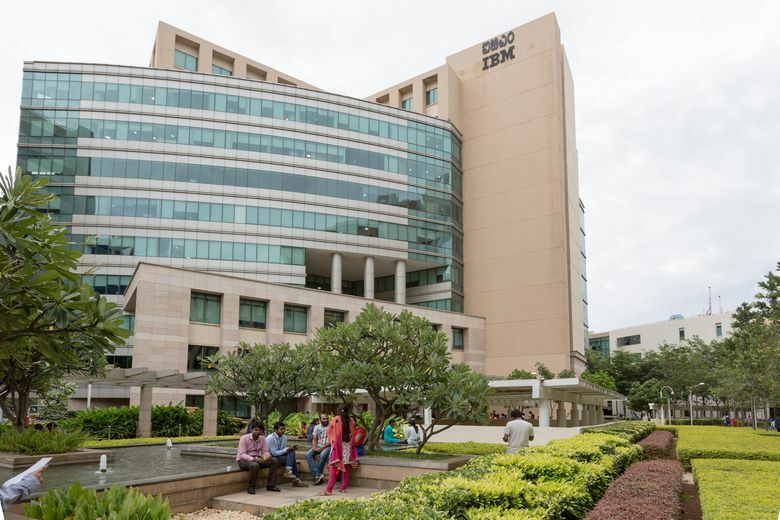 IBM, which opened its first Indian offices in Mumbai and Delhi in 1951, is spread across the country, including Bangalore, Pune, Kolkata, Hyderabad and Chennai. 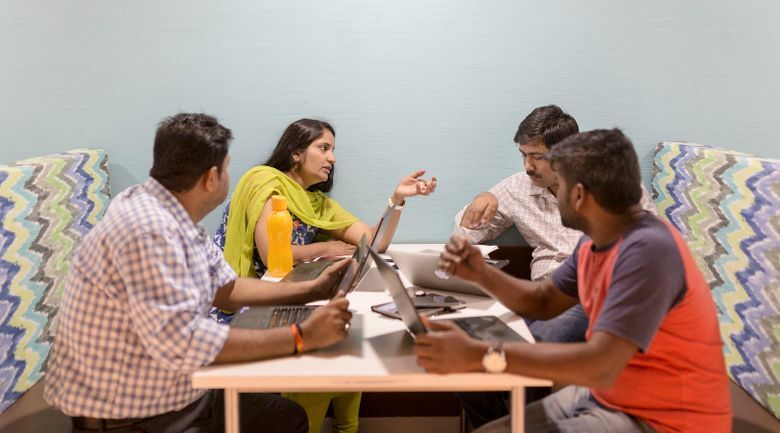 Most of the Indian employees work in IBM’s core business: helping companies like AT&T and Airbus manage the technical sides of their operations. Indians perform consulting services, write software and monitor cloud-based computer systems for many of the world’s banks, phone companies and governments. But researchers in India also try out new ideas. Looking to build a new system for searching with images instead of words, a team in Bangalore turned to Watson to index 600,000 photos from the world’s top fashion shows and Bollywood movies. In spring, a major Indian fashion house, Falguni Shane Peacock, tried the tool, which helps designers do a riff on an old look and also avoid direct copies, and it generated new patterns for three dresses. IBM’s outsize presence in India is all the more striking given that it left the country entirely in 1978 after a dispute with the government about foreign-ownership rules. IBM re-entered the country through a joint venture with Tata in 1993, initially intending to assemble and sell personal computers. IBM’s leaders soon decided that India’s potential was far bigger — both as a market and as a base from which to serve customers around the world. The company took full control of the venture, established an Indian branch of its famed research labs, and in 2004, landed a landmark 10-year, $750 million contract from Bharti Airtel, one of India’s biggest phone companies, which remains a major customer.